The LEDs on the front of the device, shown previously, provide a quick indicator of the Ethernet network you're testing. The LEDs blink while a test is in progress, are red if the test fails and green if the test passes. The only exception is the Wi-Fi LED, which is blue when Wi-Fi is manually enabled and off when manually disabled. As discussed earlier, the LinkSprinter 200 can transmit test results via Wi-Fi to a computer, smartphone or tablet. The LinkSprinter transmits an unsecured 802.11b/g Wi-Fi signal. There are two adjustable Wi-Fi options. You can change the SSID and the channel (1-11). There are no options to enable Wi-Fi security. All you do is connect to the LinkSprinter's SSID and browse to its default IP address (172.16.9.9). No application needs to be installed on the PC, smart phone, or tablet. This makes testing quite convenient by simply carrying the pocket size LinkSprinter, an Ethernet cable and a smartphone. Below is a screenshot of test results from my iPhone connected to the LinkSprinter via Wi-Fi. The remaining screen shots in this review were taken from a PC to simplify pulling screen shots. Functionality and information displayed on my iPhone and PC were the same. My first test was to connect the LinkSprinter to a ZyXEL GS1900-HP PoE (Power over Ethernet) enabled switch, which has a total PoE power budget of 70W. I tested the LinkSprinter connected to the GS1900-HP with several other PoE devices connected and with no PoE devices connected. I ran the test with two different Ethernet 6' pre-made CAT 5E Ethernet cables. In all my tests, as shown in the screenshot below, the LinkSprinter detected 55V coming from my PoE switch. The ZyXEL switch reports only PoE power consumption, which was 4.2W. When connected to a PoE source, the auto-off function is disabled on the LinkSprinter as it will draw power from the PoE source instead of batteries. I took the batteries out of the LinkSprinter and connected it to my PoE switch, and verified the LinkSprinter can run on PoE power alone. The auto-off function simply turns the device off after 3 minutes to extend battery life. The next test performed by the LinkSprinter is LinkStatus. Speed, duplex, wiring, and polarity are all tested. As you can see in the image, the LinkSprinter has detected it is connected to a 10/100/1000 full duplex Ethernet port, with wires 3 and 6 used for receive, and having normal polarity. I enabled the Test 1Gb feature for this test. I changed the settings on my switch so the port being tested was only running at 10 Mbps. As you can see from the second screenshot below, the LinkSprinter correctly detected a link speed of only 10 Mbps. The LinkSprinter also reports switch and VLAN information. The next screenshot is the LinkSprinter's display when connected a NETGEAR GS108T. The LinkSprinter is correctly displaying that it is connected to port #6 and VLAN 1. In my testing of the LinkSprinter, switch information display was inconsistent. According the LinkSprinter support site, the LinkSprinter detects switch information via LLDP/CDP. I connected the LinkSprinter to a NETGEAR GS108T, Zyxel GS1900-HP and Cisco SG-200 switch. All three had LLDP enabled and could detect each other via LLDP, but the LinkSprinter picked up switch information only from the NETGEAR and Cisco switches. Fluke Networks said the LinkSprinter uses the identical LLDP/CDP discovery code used on its more expensive LinkRunner product. The code has been verified on over 40 different products from nine manufacturers and also supports Extreme Discovery Protocol (EDP). I'll be providing a Wireshark trace of the LLDP/CDP session to Fluke and will update the review when the problem cause is found. I also tried connecting the LinkSprinter to 802.1q VLAN trunk ports on two different switches with multiple active VLANs. But the LinkSprinter connected only to a single VLAN. I tried various combinations of permitted VLANs on a trunk. It appears to me the LinkSprinter only tests and detects the native VLAN on a port. Fluke Networks confirmed that joining a VLAN is not currently supported. The LinkSprinter will use DHCP to acquire an IP address and validate the presence of a DHCP server. Alternatively, you can give the LinkSprinter a static IP address. I tested both successfully. Once the LinkSprinter gets an IP address, it pings the DHCP identified or programmed gateway three times to verify connectivity. As shown in the screenshot, the LinkSprinter has connectivity to my router at 172.23.1.1, with ping times of 1ms. The last test performed by the LinkSprinter is to verify Internet connectivity. It does so by going to port 80 of a preset website (google.com). You can customize the website and port it checks, however. Alternatively, you can configure the LinkSprinter to ping a specific address instead of browsing a website. Below is a screenshot showing the LinkSprinter successfully connected to google.com. As a final test, I connected the LinkSprinter to a network with no Internet connectivity. The LinkSprinter now displayed google.com in red, correctly indicating loss of Internet connectivity. As mentioned earlier, your test results are emailed to the email address you set up in your LinkSprinter account as they occur. In addition, test results are recorded on the Cloud Service dashboard. Below is a snippet of the dashboard from my tests, showing results with switch information, different IP addresses, and with and without PoE. Email and dashboard functionality are features of the LinkSprinter Cloud Service, which can also be used to configure the device. Further, the Cloud Service provides the ability to comment your test results, sort, analyze and filter results, generate custom reports, and update firmware. Fluke is offering the LinkSprinter for sale at Amazon.com. The LinkSprinter 100 is listed at $199 and the LinkSprinter 200 is listed at $299. $100 seems like a big jump in price for Wi-Fi, but it certainly adds to the convenience factor by allowing you to use the LinkSprinter with a Wi-Fi enabled browsing device. In addition to the purchase price, Fluke prices the optional cloud service at $9.95 for 100 tests and $79.95 for 1000 tests. There is currently a promotion that if you purchase a LinkSprinter by May 31, 2014, you get unlimited use of the Cloud Service for the first 120 days. Both model LinkSprinters also come with 10 free tests per month and free configuration support, forever. According to the folks at Fluke, "The Cloud Service is optional. The LinkSprinter functions like an ordinary tester without it. Like traditional testers you can test indefinitely without it and view your test results on your LinkSprinter or your phone with the model 200." Although the Cloud Service is optional, the LinkSprinter 100 without the Cloud Service is pretty limited. You can only view results via LEDs and won't be able to view PoE, link, switch, VLAN, or IP details, nor will you be able to configure the device. The LinkSprinter 200 without the Cloud Service has fewer limitations due to its Wi-Fi connectivity. With either device, the Cloud Service is useful, but the pay-per-test cost can add up quickly. I generated nearly 50 tests writing this review. Perhaps Fluke will come out with an unlimited price option for the Cloud Service. Responding to customer feedback, Fluke Networks dropped all cloud service fees as of 4/22/14. Fluke Networks said its goal in producing the LinkSprinter was to bring tester cost down to the point where even hobbyists and prosumers could purchase it. 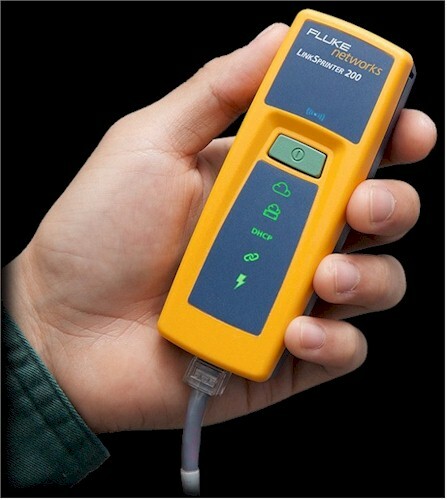 $200 and $300 price points are significantly below other Fluke Network test instrument prices, which typically run thousands of dollars. But $300 is pretty heavy lifting for the occasional use a hobbyist might have. Pricing the LinkSprinter 100 and 200 at $100 and $150 might bring more buyers in the door, but the additional volume probably would not offset the lost profit margin on each unit sold. Pricing issues aside, I really liked the Fluke LinkSprinter. I found the LinkSprinter 200 super convenient to carry around and use and it sure beats lugging a laptop around to test Ethernet ports. Finally, it is ridiculously easy to run a test, works quickly, provides useful results and the Wi-Fi functionality with no app to install is brilliant!